Ever have a hankering to pat a hippo, pose with a giraffe, hug an emu? All this and more is quite possible–no danger, no admission charge, no plane ticket to Africa. 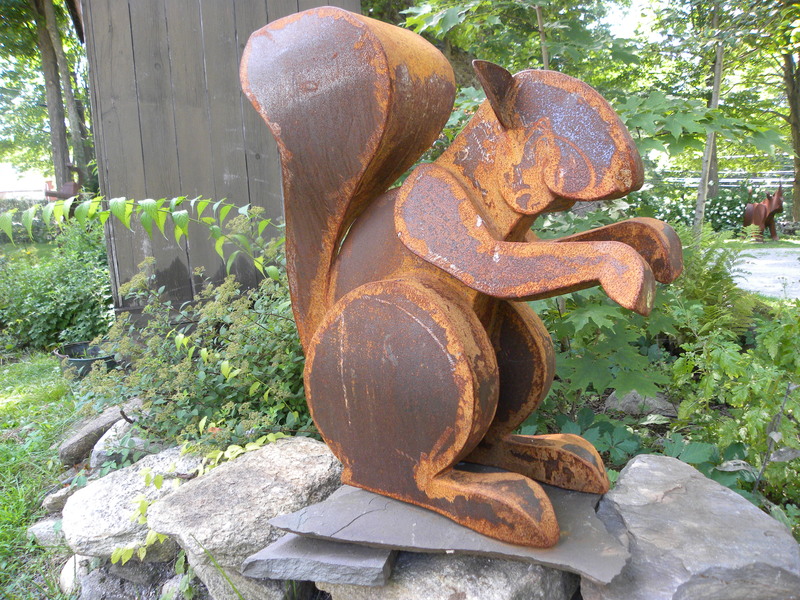 Just go for a visit to the yard of sculptor Denis Curtiss on Route 7, next to Kent Falls State Park in Kent, Connecticut, fo the opportunity to stroll among life-size steel animals that stalk and cavort. Retired from a career teaching art all around the world, Denis can now be found behind a welding mask in his studio, creating enduring works of art that are delighting collectors around the country and beyond. Sheets of flat metal are cut, then welded into triangulated shapes that assemble to a unique cubist sculpture that is extremely strong. Never static, the animals are in a state of movement: horses prance or rear, goats leap, cats pounce, elephants trumpet, roosters stomp. They each exude personality. Denis has been recognized at the world’s largest dog art show, winning the top honr for a terrier in a playful bow. The AKC’s Museum of the Dog in St. Louis has displayed his life-sized dogs. More of the work of Denis can be visited at the Interlaken Inn in Lakeville CT. The National Trust for Historic Preservation at Chesterwood in Stockbridge MA selected two sculptures for their Contemporary Sculpture exhibition. 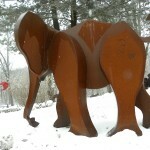 Centerpiece for the Darien Nature Center’s special exhibit on elephans stood a Curtiss sculpture. The City of Lincoln, Nebraska purchased a sitting baby elephant to enhance an urban park. Barnum Museum in Bridgeport displayed two giraffes, twelve large animals spent the summer prancing the streets of Stamford CT, singer Andy Williams purchased 24 animals for his Moon River Theatre in Branson MO and for his own home. His work can be found in private collections in 20 states and 3 countries.